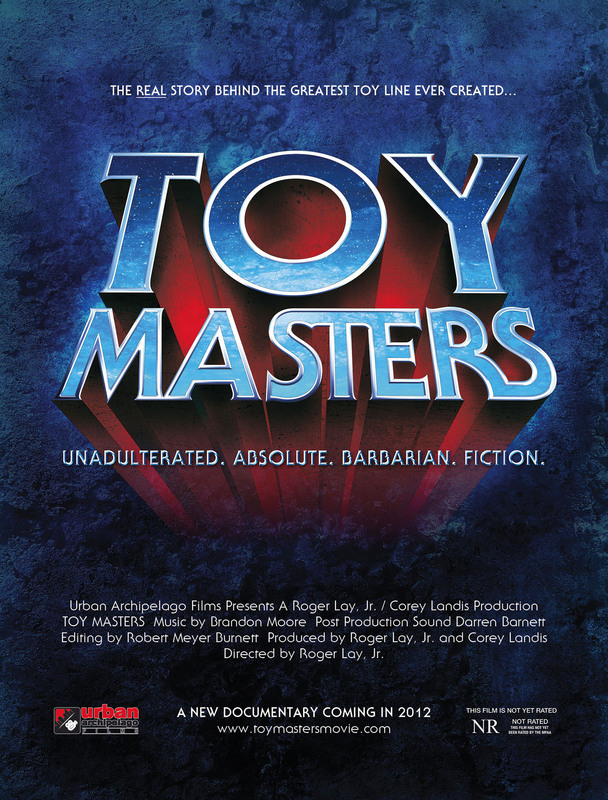 "Toy Masters is the first everfeature-length documentary about the worldwide billion-dollarphenomenon that inspired an entire generation of children: Masters ofthe Universe (MOTU). Filmmakers Roger Lay Jr. and Corey Landis havetracked down all the key players in search for the answer to thequestion: “Who actually created He-Man?” The filmmakers will bescreening exclusive material from the documentary and participatingin a Q&A at this year’s San Diego Comic Con, being held at theSan Diego Convention Center on Friday, July 13th, 2012, from8:30pm-9:30pm in room 26AB. Legions of MOTU fans are alreadybuzzing with anticipation. It is likely the film will reach an evenwider audience once released, (a la King of Kong), for thecontroversial rivalry between former Preliminary Designer for Mattel,Roger Sweet, and former Visual Designer for Mattel, Mark Taylor,(both of whom are claiming bragging rites for the initial conceptbehind He-Man), makes for a compelling, and highly entertaining film. During this special one-hour panel fanswill get to see exclusive never before seen footage from the epic toyindustry smack-down that is TOY MASTERS. Moderator Robert MeyerBurnett (Director, Free Enterprise, Femme Fatales) will be joined onstage by Toy Masters director / producer Roger Lay, Jr andco-producer Corey Landis. Joining them on the panel will be many ofthe key players from the franchise's 30-year history including writerJ. Michael Straczynski and designer Mark Taylor. The film, which is already being hailedas the next KING OF KONG and the SOCIAL NETWORK of the toy industry,features interviews with the key creative personnel behind everyversion of the best selling toy line and all incarnations of "Mastersof the Universe" on television, film, stage, and print, tracingthe inception and ups and downs of the fantasy juggernaut. Everyoneinvolved in the 30 year history of this beloved franchise makesappearances in the film including such genre luminaries as J. MichaelStraczynski (Babylon 5, Marvel’s Thor), Richard Edlund (Star Wars,Raiders of the Lost Ark), William Stout (Conan The Barbarian, Pan'sLabyrinth), Lou Scheimer (Filmation co-founder), Michael Westmore(Star Trek Franchise), Don Glut (Empire Strikes Back, TransformersAnimated), and Gary Goddard (Terminator 2-3D, Captain Power). Follow TOY MASTERS on the Facebookgroup for updates, including exclusive details on how you can be oneof the first to see the film. Or go to the film’s official sitefor a first look at the trailer. Also, during the Comic Con panel, thefilmmakers will reveal details on the world premiere of the film,which will be hosted by one of the most prestigious film festivals inthe Science Fiction and Fantasy genre."